Manchester United’s latest visit to the Emirates was a fruitful one, as the Red Devils rioted 3-1 against the Gunners to qualify further into the FA Cup. 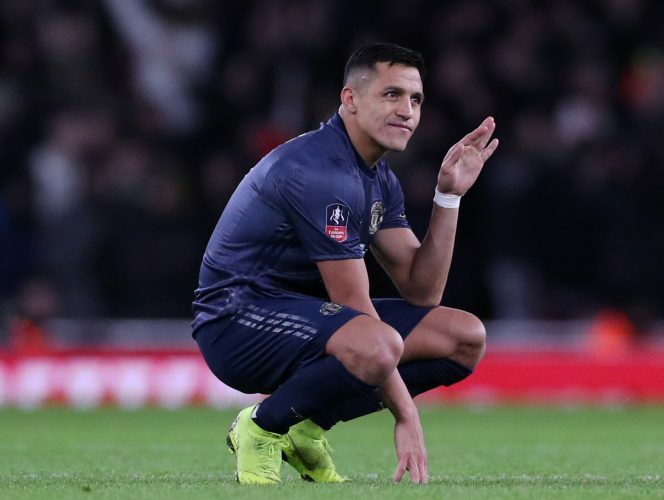 The Mancunian side benefited through goals from Alexis Sanchez, Jesse Lingard, and Anthony Martial, while Arsenal had a consolation strike through Aubameyang. The London giants will certainly be kicking themselves after the defeat, as a Jose Mourinho managed United would have never played as offensively as the Red Devils did on Friday. The most painful moment of the night arrived when Alexis Sanchez opened the scoring for Manchester United. Up until that point, the Chilean was heavily booed by the Emirates, a response to his forced departure from the club last season. But to have a former player score against you does sting. What makes matters worse is that Sanchez hasn’t exactly been having the sort of form that would make the goal seem dismissible. In fact, it was only his fifth goal for United since shifting from the Gunners. Arsenal fans took to Twitter and made their displeasure known quite strongly. Alexis Sanchez is trash for an entire year and a half but still scores against Arsenal. This is just how things work for this club. Haven’t seen Alexis Sanchez look so happy on the bench at the Emirates, since Bayern beat Arsenal 5-1! The soreness of some of those tweets is certainly understandable, given that the club is still in its transition period under Unai Emery, and would have been looking at the FA Cup as some viable hope for silverware. Further, the sheer impact that Ole Gunnar Solskjaer’s reign has brought to United is more evident through a glance at the Premier League standings. After Mourinho’s fateful defeat to Liverpool, catching up even to Arsenal seemed like a tall task. A month of attacking football later, United are level on points with the Gunners, and are certainly the favorites to break through into the top four ahead of the London teams. Friday simply wasn’t the best day to be a Gunner.